My children’s school no longer allows them to bring any nuts. No peanuts, almonds, pecans, cashews, walnuts, hazelnuts – NADA! This rule change was due to the fact that there are children with extreme nut allergies and the school district wants to ensure the their safety. Since I still want my kids to eat nuts because they are a great source of nutrition (and my kids love them), I came up with these “Energy Balls” for breakfast so they can have nuts BEFORE they go to school. The best thing about the Energy Balls is that they are raw (no cooking!) and you can make them in a flash. Also, you can store them in the fridge for a week and serve them whenever a child demands a cookie. These make a great breakfast for the adult who is in a rush and regularly eats packaged breakfast bars. My Energy Balls will rid you of the breakfast bar habit FOREVER. Not kidding. Have you had to deal with a ban on nuts? What is your solution? Place almonds in food processor and pulse until chopped. Add dried fruit, nut butter, and granola, and pulse until well mixed. Try to form a 1 inch ball in your hands. If the dough does not stick together add 2 tablespoons of water and pulse again until dough is more sticky. 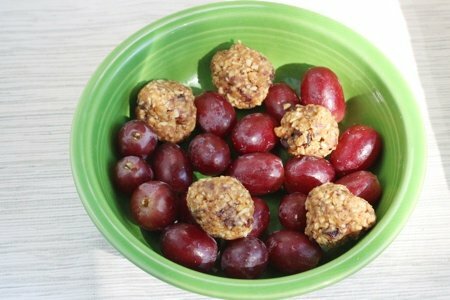 Make 20 balls and eat immediately or refrigerate for later. I love energy balls. I make them all the time; open the cupboard and bring out any nut, seed, and dried fruit there is there, and blend them up. Also can add a drizzle of molasses for liquid which is loaded with calcium and potassium. Also can add cocoa, or shredded coconut, or chia seed, sesame seeds; go for it! I can not wait to try these! As my husband & I are 'morning rushers', these will be perfect! Keep the healthy snack ideas coming! Yes, I'm a teacher and we have kids highly allergic to nuts. In one of my fellow schools there was a child so chronically allergic to nuts that if another child had nuts for breakfast at home and sat next to the allergic child at school a few hours later the allergic child would still have a terrible reaction. That was an extreme case. I wonder how so many children have such reactions nowadays. I never encountered anyone like that as a child. These sound great. I'm on the hunt for easy breakfast options that don't involve carbs - related to your post yesterday. Love your creative ideas, Snack Girl! And love your commitment to keeping kids, like my daughters, safe at school. I know this is a huge inconvenience for other parents like you. It is a huge inconvenience and daily source of terror for me. Thanks for being a cheerleader for food safety this morning! Do you buy the granola toasted, or buy it and then toast it? @KGK - Simply use the packaged granola (or homemade) as is. In most cases it is already toasted (unless it is Muesli). Thanks for the question! These sound like a terrific breakfast, as well as snack (as you suggested). Thanks so much for the great idea! They sound great, but like Giselle stated, sometimes having a friend who had nuts for breakfast can trigger a reaction. Giving nuts before school if you know kids in the class have severe allergies probably isn't cool. At least would be a good idea to brush teeth and wash hands and faces well in between. I love this idea and the fact that there are so many fruit and nut choices. I think these would be a great snack for us as we need to have about 5 small meals and snacks each day. I am always looking for new recipes. Thanks! for Giselle Mouttet - Hi there, I agree that this seems to be more prevalent today than when I was growing up. I think there are many more triggers today including environmental factors that can lead to food sensitivities and other allergies. Improper nutrition and certain medications are big triggers in my opinion. This may not be the fault of the parent but many foods now grown in the U.S. are grown in depleted soil and the roots do not go deep enough to absorb rich amounts of nutrients. Steps are being taken to plant foods with longer root systems to help overcome this problem. When I was growing up I had tests done that revealed that I was allergic to over 200 items that included mostly food and pollen. I had to have allergy injections and steroids for years which ultimately triggered my diabetes when I had to have steroid injections upon moving to Texas. It was primarily the cedar, which is everywhere, that was the biggest problem. I had bad allergies for the first several years. Then I started supplementing my diet with magnesium and other whole food supplements and I have not had an allergy problem since and no allergy injections or steroids. It has been about 5 years now and it is wonderful to be free. I hope that people will read this and check to see what whole food supplements (not necessarily Gummie bears) will help them and their children. Awesome, Lisa. Can't wait to try these. Thanks. Great idea I love the recipe and will try it. I love all nuts...and when you said no nuts at all I had a mini breakdown in my head...like what if my job said that! I eat nuts literally all day...breakfast lunch snacks and sometimes if appropriate in dish dinner. I should be a squirrel! I love this idea...my husband makes his own special snack mix with certain nuts etc. He eats them in their natural form. I like this idea because it's goodness all packed into a neat little ball! I look forward to seeing your email every day! I save them in a special folder so I can refer back to them. Thank you for sharing your knowledge and great ideas. These are fabulous. Wondering how many would make a snack or meal. Would love to know for myself and grandkids. Thanks for all that you do to promote healthy eating!! I thought I would share what I did when my kids were young. My kids came home for lunch and occasionally had pb & j sandwiches for lunch. I would put a tea towel or small towel around them for a bib. I sat with them so no wiping hands on clothing. Then we washed hands and faces before heading back to school. It worked for us and was the best I could think to do at the time. Hi On Sept. 13 th I posted a comment about how many of these balls would make up a meal or snack. I have had no response to my disappointment.HELP! Hope to hear soon, my grandchildren are asking me daily. @Nuala, Sorry, things get busy over here! I would think that 2 balls would be good for a snack and 4-5 would be good for a meal.